There was some activity in Emily's egg sac the other day and I discovered Pteromalidae Parasitic Chalcid Wasps emerging from it. 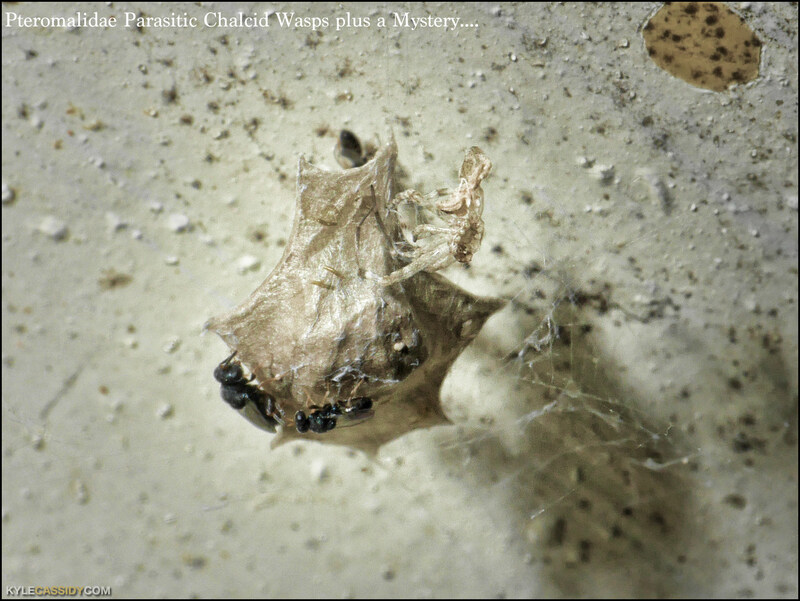 They lay their eggs in spider egg sacs, the larvae eat the baby spiders and then hatch from the egg sac and fly away to do more evil. If you look closely, you can also see what look like some sort of worms burrowing in or out -- not sure what they are, if they're related or not. And also, a mystery. You'll notice in the upper right, that thing that looks like an alien skin? That's a spider moult. I don't think it was one of Emily's babies though, I think it was another spider that just happened to moult near the egg sac. Happy to hear input from spider experts. It's worse than a sad day at Fortress Hennepin. I was looking forward to Emily's babies. She was unaware the entire time, just sitting there in her web. No idea where George is. I've gotten used to him vanishing though. Oh, man, I'm so sorry. Maybe she and George will try again. That is really creepy and unfortunate! I know that in the grand scheme, parasitic wasps are part of nature too, but nobody likes to see bad things happen to good little spiders! *sigh* I hope nothing happens to Emily as these wasps emerge, and that we get to see the next cycle of eggs come to fruition. I am really enjoying this particular photographic journey. It's fascinating. It yet again makes me want to invest in a better camera, at which point I look at my bank account and sigh. I was immediately googling "what eats Chalcid waps" and one of the things was ... spiders. I hope Emily catches the next one incoming. As revenge. Oh no! Things should not be red in tooth and claw right on your porch. are there two egg sacks? this one looks to not have all the webby-debris that the other recent one had? maybe the debris acts as a barrier? This has been a fascinating, if tragic for the spiders, journey.